So which tool is the “winner?” It really depends on the application. Certainly the 14.4V Impactor is more powerful and offers a longer runtime than the PS40, but this isn’t surprising when you consider that the entire PS40 weighs only a bit more than the 14.4V’s battery. What is surprising is that the PS40 delivers about 60-75% of the 14.4V Impactor’s performance in such a tiny form factor. 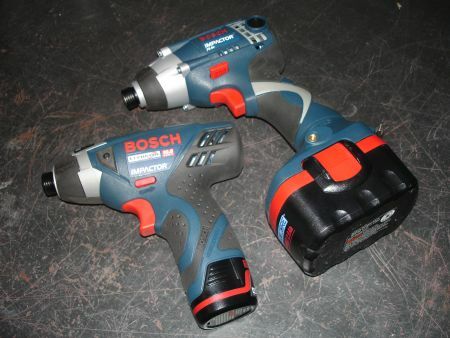 The PS40 fits into an entirely different market niche than the 14.4V, offering those who wouldn’t normally carry an impact driver the option of doing so. And when you consider the results of our “big screw test,” it’s clear that the PS40 can really step up to the plate if you find yourself caught out without a bigger driver. We’re just as excited as when we first heard about the PS40, and we’re looking forward to seeing it on shelves soon.